Totemm© - stylus wrap-on. Your stylus @ ready, fingers free. 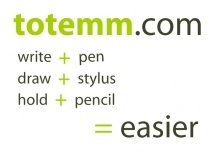 Totemm is a low-tech way to make your screen time more comfortable and productive. 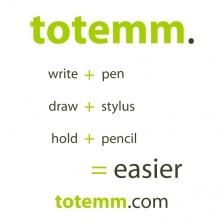 If you use a pencil, pen and these days... especially a stylus - Totemm will rock your world. You'll wonder how you lived this long without it. Your hands and arms will be less stressed and you'll be able to work more efficiently on your ipad, graphic tablet like Wacom and even just while using your computer. As a designer, I spend alot of time in front of my screen. I use a Wacom tablet.